John Hattie’s research got a lot of attention from the media linked to the publication of his Visible Learning meta-study. The problem was that many individual aspects of his research were taken and used as a kind of checklist that could magically improve schools. It won’t work like that. 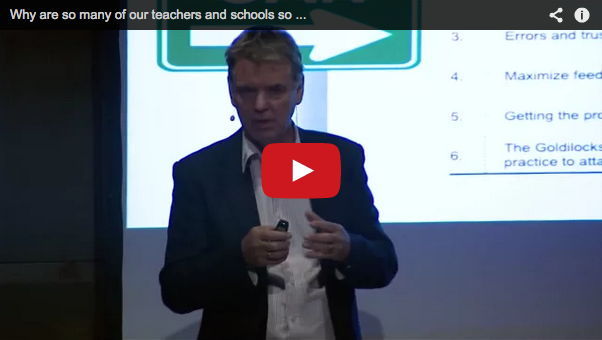 John Hattie’s TED talk “Why are so many of our teachers and schools so successful” can be a good starting point to putting it all in context. You can find a lot more information about John Hattie and his research here on our website. For a deeper insight into Visible Learning you should definitely read the books! Your work is so real and lacking in B.S. As an educator proud to practising when our system was recognised as one of the best in the world and having witnessed its unfortunate demise, I find th work of you and your colleagues extremely inspiring. And it gives me hope for the future of education in Australia. With profound regards we humbly request you that We are a voluntary organization which sets up work in Indus Valley Sindh, the southern part of Pakistan our project is to help and facilitate a libraries program in Sindh, with the name of “Mother of Civilization Library” We therefore anxious in collecting resource materials including any books Honorable Professor John Hattie an internationally a well-known a researcher in Education and author. Here is a large part of schools, colleges and university aged population in Sindh towns and countryside, who love to read and know more about his work, “Visible Learning for Teachers, Visible Learning, Visible Learning and the Science of We Learn, Self Concept, Intelligence and Intelligence Testing, , and other books & DVDs”, as we are unable to purchase books due to lack of resources and fundamental facilities of libraries. Your donations of books can do much to stimulate and encourage the growth of learning, especially among the young generation of Sindh about it. Therefore we appeal your great institution to make a little contribution of above books on compassionate and humanitarian ground; the result would be the placement of new or used books (or equivalent educational materials) into the library for needy and destitute Students. Hope you will consider our humble supplication with the glance of appreciation and make small numbers of books donation for this libraries program. In case, you wish to know more about our libraries program and various facets associated with it. Please free to contact our office on all the days. Your research on “5 Big Ideas In Education That Don’t Work” mentioned that money spent on students do not seem to make a difference in student performance. You used the example of how Korea spends $60,000/student whereas the U.S. spends $105,000/student from first grade to high school graduation. In Korea, the difference of $45,000 and more is made up by parents who send their children to private tutors, after school academy, and enrichment classes. Money talks and makes a huge difference in student achievement. This kind of one sided research that compares the inside of the U.S. education system with outside of Asian countries is at best, quite misleading and displays lack of understanding of the educational realities in Asian countries such as Korea. Asian students perform highly because they are driven by their parents, not by the public education system. Asian parents invest heavily into their children’s education. In China, 6 adults (mother, father and 2 sets of grandparents) are all investing financially in 1 child. (this is one of the effects of China’s one child policy)(https://www.washingtonpost.com/news/wonk/wp/2015/10/30/why-many-families-in-china-wont-want-more-than-one-kid-even-if-they-can-have-them/?utm_term=.367438b48f81) In particular, please note that many Chinese families are spending more than the average annual disposable income on their child’s education. Yes, money makes all the difference in education. Your calculation of $40,000/student is sufficient for a decent education that can put American students out in the front of the world competition is not at all supported by the available data. As a Korean immigrant who came to the U.S. at the age of 18 with a full experience of how Korean education works and as a teacher in the U.S. who works in a Title 1 school, where 95% of the students get free to reduced lunch I see the impact of poverty and what it does to students performance every day. Common sense tell us that the Law of Diminishing Return applies to all things, and it probably applies to education, but I do not think you can use the Asian model to suggest that we are quite there, yet, here in the United States. Thank you for sharing a realistic view regarding these misleading statistics. I attended an in-service on equity in pupil service delivery based on modules from a website. They quoted Hattie as saying that flexible grouping was ineffective. My impression from reading Visible Literacy was that flexible small grouping was an effective strategy. District leaders want to prohibit all non-heterogeneous grouping in instruction. Thoughts? I keep getting asked by my students as to why epistemology is not included as a topic for study in the New Zealand and Australian education curriculums. I know it comes under ‘the theory of learning’ in the European Baccalaureate system, but wonder at the reasons it was dropped in Australasia in the early days of curriculum formation. Can anyone help me with the historicity of this bizarre phenomena, or who to turn to who might be able to help. It’s no wonder the average modern day graduate can’t even distinguish relative truth from absolute, or personal taste from universal principle is it? I teach in a K-2 building and we are grappling with how to implement the changing of all of our Learning Targets daily to meet the expectation of our teacher evaluation (5D+) to do so. I am curious. In your research did you find as strong of a link between effectiveness and the daily changing of Learning Targets in the youngest classrooms as, say, you did in the upper grades such as high school? Thank you. Have you looked at the effect size of Lesson Planning and of Standards Alignment work? @john_hattie Hi there, can I ask, with regards to ability grouping having a negative effect size, in particular with regards to high attaining students, is the evidence for this based solely on studies of ‘single school year’ classes? Since 2006 we organize bianually a Congress on Neuroscience and Education in Brazil. I would like to get contact with Professor John Hatie in order to invite him and have information about his fee and availability for this event that will be held in August 24th and 25th of 2018. I am studying a TEFL qualification – Teaching English as a Foreign Language. I am 48 and after a career in international trade and now exploring a move into teaching / development. I am English and living in Istanbul, Turkey. I am finding everything I am learning both fascinating and appropriate – I am keen to start my practical teaching correctly so would like to meet other teachers who follow the principles of teachers. Does you organisation have any followers in Istanbul ? I realize this is a long shot, but all I can do is try! I’m interested in your thoughts on the use of a PLC model at the regional level. Would your research support the power of using the collaborative professional learning community on a wider scale, not just school level? Do you know if this regional model has been used in other places? Thank you so much for your consideration and your impeccable work towards increasing our impact on student success. Sharing your thoughts on what works(?) promotes self evaluation. It is quite helpful for me to determine at the outset what do my students already know. That gives me a starting point which acts as a springboard into what they do not know. During any semester it is always helpful for students to determine if they made errors because it is a chance for them to rethink, understand and make corrections. All of your comments take me back to our professional learning committees and what we teachers learn from each other. Thanks for all you do for us. I am conducting a study of engineering students with the John Hattie’s effect size. In the calculation of effect size, what is the simple meaning of postassessment score and preassessment score? Hope to read you very soon. I am looking for research on effect size for two things. Is there someone who has analyzed effect size of these and can suggest if either or both are worth spending the money? In 2012, Visible Learning ranked student-centered practices as an effect size of .53 on the ranking chart (Hattie, 2012). In Chapter 9, page 157, Hattie references Cornelius Wright (2007) as producing a .61 effect size of the relationship between person-centered practices and cognitive student domains and a .71 effect size for the relationship between person-centered practices and affective student domains. I have two questions: 1- why did the chart state a different effect size than the referenced study, especially since the long chart in the book stating all of the studies analyzed does not show any other studies analyzed. 2 – Why did the effect size ranking in 2018 change to .35? With profound regards we humbly request you that We are a voluntary organization which sets up work in Indus Valley Sindh, the southern part of Pakistan our project is to help and facilitate a libraries program in Sindh, with the name of “Mother of Civilization Library” We therefore anxious in collecting resource materials including any books of Professor John Hattie an internationally a well-known an education researcher and author. Here is a large part of schools, colleges and university aged population in Sindh towns and countryside, who love to read and know more about his work, “Visible Learning, Visible Learning for Teacher, Visible Learning for Literacy, 10 Mainframes for Visible Learning, Intelligence and Intelligence Testing and other books & Lectures DVDs”, as we are unable to purchase books due to lack of resources and fundamental facilities of libraries. 59 other websites write about for "Professor John Hattie"